SUMMARY: Open your website analytics report and there are many numbers staring you in the face. But are they good or bad? Wouldn't you love to peek into the analytics reports for other companies and see what numbers they are experiencing? In this MarketingSherpa Chart of the Week, we do just that, and explore the percentage of returning visitors reported by 1,950 marketers. Q. Please indicate the 2013 level of the following metrics and their ongoing trend. One of the metrics we asked about was percentage of returning visitors. We also wanted to know if the percentage was rising, steady or falling to help determine how ecommerce metrics were trending. This chart shows how marketers responded, and then keep reading below for further analysis of the research. 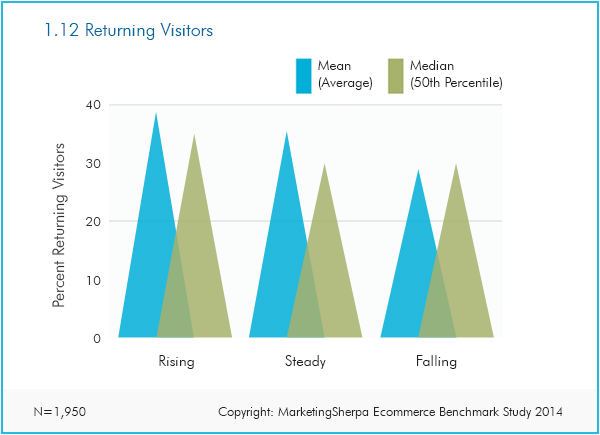 A little background on the above chart: Only 3% of marketers reported a drop in returning visitors, while 44% of respondents said their company's percentage of returning visitors was rising, and 53% said their percentage of returning visitors was steady. So to make a broad generalization of the data, companies report roughly one-third of visitors are returning visitors, with companies reporting a rising percentage of returning visitors doing somewhat better and companies with a falling percentage of returning visitors doing slightly worse. When we broke the out data by revenue, companies with lower revenue reported a much wider disparity of responses than high-revenue companies, perhaps suggesting that as companies increase revenue, they are able to grow a more consistent base of visitors as opposed to the wild fluctuations of smaller companies. 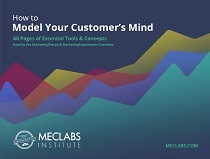 These companies may be greatly influenced by stop-and-start customer acquisition campaigns constrained by limited budgets. While percentage of returning customers is a more valuable metric than returning visitors, returning visitors can give you a general idea of how enticing your website is to potential customers. Also, the more complex or competitive your industry is, the more important returning visitors are because customers may not, in their typical buyer's journey, be prepared to buy from you on the first visit. They also may be conducting significant comparison shopping or even basic research and return to your site one or many times before deciding which e-retail (or even brick-and-mortar) store to purchase from. Also, it tends to be more difficult and expensive to stand out and drive new traffic for a brand potential customers have never heard of in competitive products and industries, so having a site, remarketing campaign or cart abandonment program that lures visitors back is even more important. Successful companies use returning visitor data to segment website traffic and provide targeted content. New visitors may receive a general welcome explaining the value proposition of the site while returning visitors may simply see the latest content, offers or targeted information and products based on their behavior in their last visit. One Benchmark Study survey respondent targeted her site traffic as "returning vs. new" in which "returning can get special offers." Another respondent used both transactional and site analytics data, segmenting his site among "returning customers, new customers, returning potential customers (haven't bought, but have visited)."